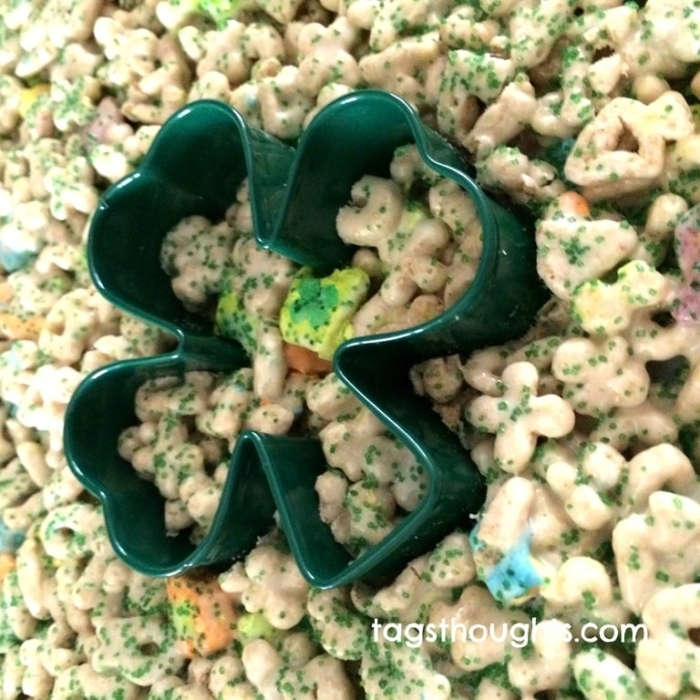 An easy to make recipe for St. Patrick’s Day, these Lucky Charms Treats are sure to make your day magically delicious! Happy Spring! 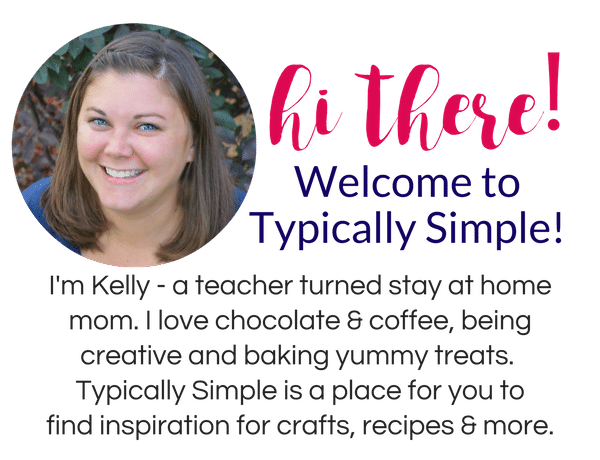 Trish here, from Tags Thoughts, and I am happy to be sharing a guest post here on Typically Simple today. I am also extremely happy that my FAVORITE month has arrived. I love March. I love all that comes with March including the weather, March Madness, St. Patrick’s Day, Shamrocks & Leprechauns, Spring Training and the excessive use of the color green. In honor of St. Patrick’s Day I have a simple recipe for Lucky Charms Marshmallow Treats to share with you. 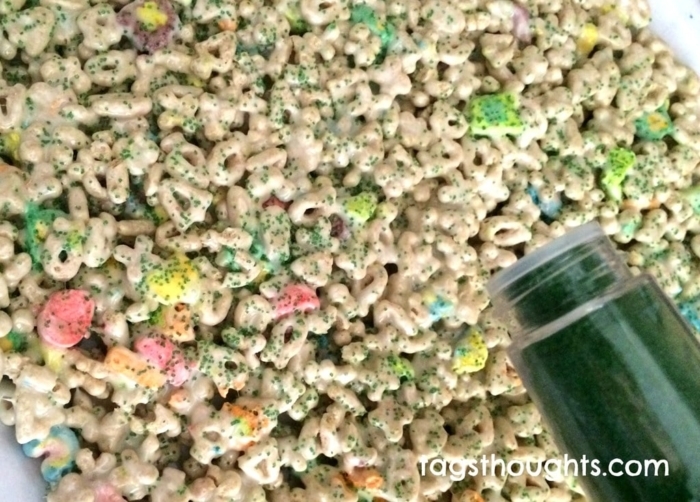 And they even happen to be topped with green sprinkles – YAY. 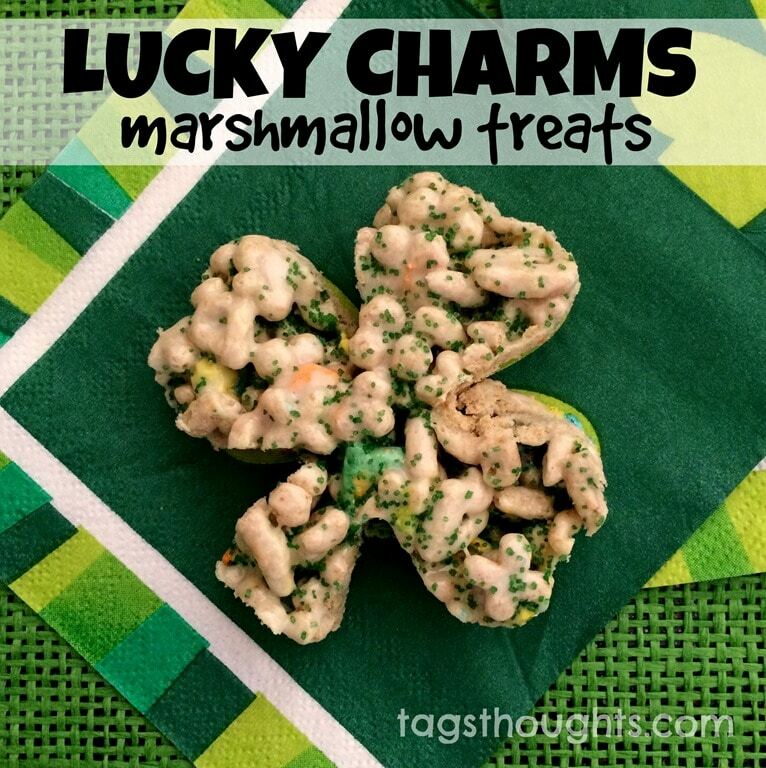 You will need just a few ingredients to create these magically delicious treats at your house. 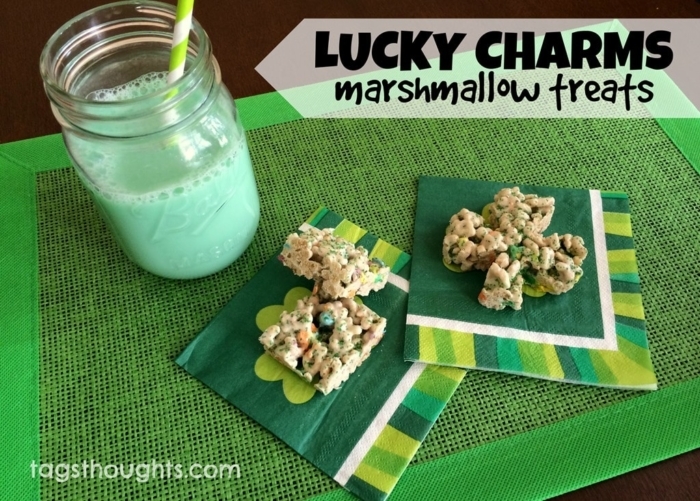 Lucky Charms Marshmallow Treats are easier to munch on when they are made “thinner” so I recommend using a cookie sheet rather than a cake pan. Begin by covering a cookie sheet with parchment paper. Cut a second piece of parchment paper the same size as the cookie sheet, you’ll need it later on. 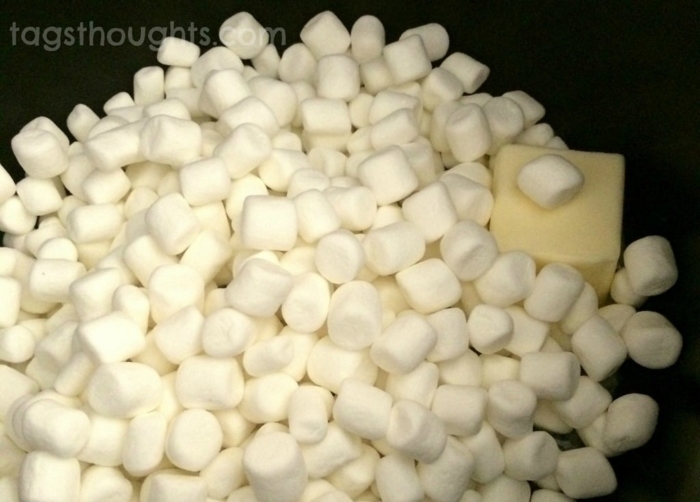 In a large pan melt the bag of marshmallows and 1/4 cup butter over medium-low heat, stirring occasionally. 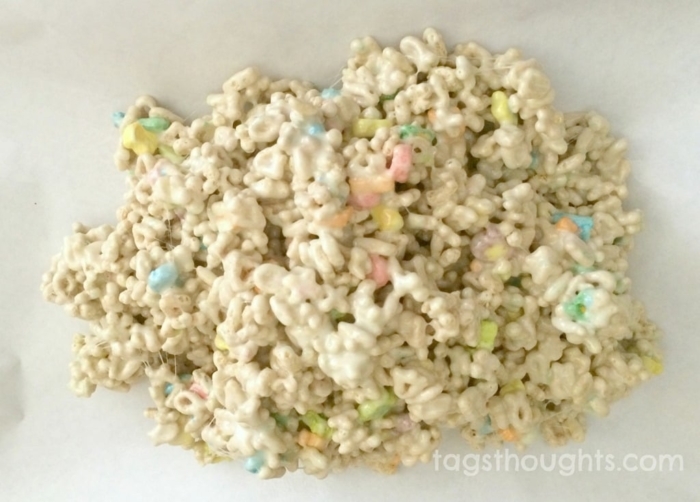 Stir until all of the cereal is covered in the marshmallow mixture then pour the gooey Lucky Charms onto your prepared cookie sheet. Cover the gooey pile with the second sheet of parchment paper and press down until the cereal mixture is spread evenly across the cookie sheet. 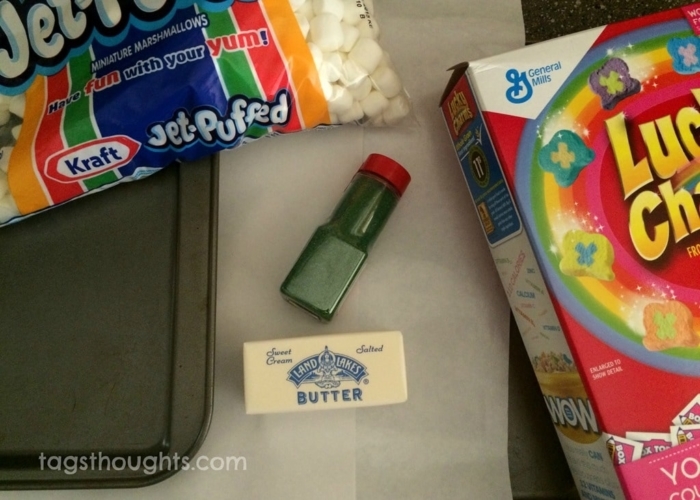 If you are anything like Kelly or my husband, THIS is when you top your treats with sprinkles. Let it set for 30 minutes to an hour before cutting your treats with cookie cutters or a knife. 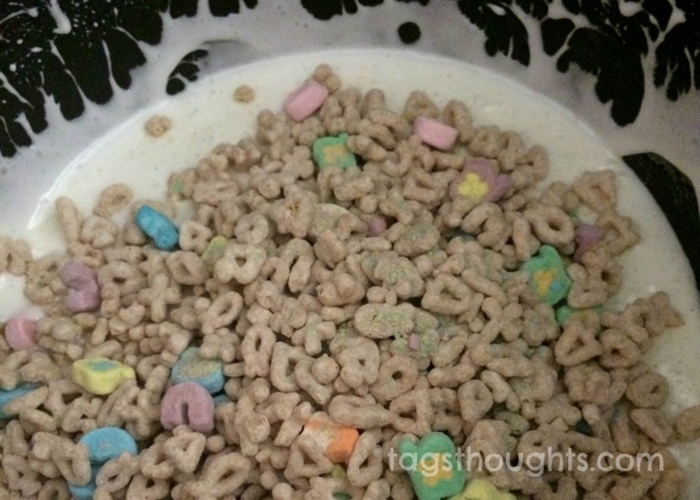 And just for fun on St. Patrick’s Day…add a few drops of green food coloring to a glass of milk and enjoy a breakfast of Lucky Charms Marshmallow Treat & green milk. YUM. A giant size thank you to Kelly for sharing her corner of the web with me today. 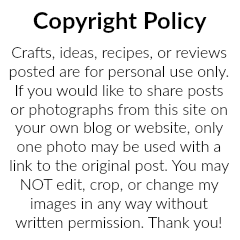 I’d love to spend some more time with you over on my blog site, TagsThoughts.com. Wishing you a March filled with Irish Luck! 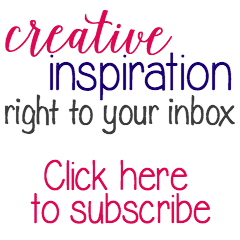 I blog over at tagsthoughts.com where I share life, simple crafts, easy recipes, giveaways and 'must have' product reviews. I am a believer, wife, boy-mom, tea addict and football fanatic.